Yet another anti-Palin tweet from Richard Bacon today to add to the ones I highlighted on Friday. So self-serving and transparent of Bacon in his continuing attempt to prove himself to his media luvvie peers, more like. 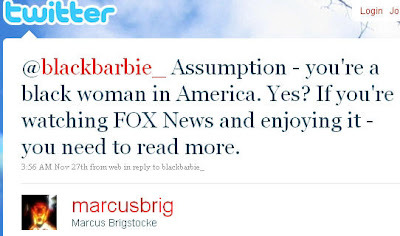 Earlier today she asked Richard Bacon why he doesn’t like Sarah Palin. How does a PC, liberal, white, allegedly impartial BBC presenter respond to such a question from a conservative black woman? No answer yet, but stay tuned. Poor Sarah does seem to bring out the worst in the BBC. They must sense she, and the people she speaks for, represent the antithesis of all they hold sacred. Fear masquersding as irony and insults. Well done to the Swiss by the way for stamping down on those god awful Muslim symbols of hate. Sarah Palin is quite simply the representation of everything Europeans and the British have always hated about the US. Every few years the innate anti-American sentiment of most Europeans and British needs to find a new target. If it can’t be the President because he’s a Democrat, then they find other targets. Even during the Clinton Administration, it was always cool to sneer at United Statesians in general, for being puritanical, ignorant, parochial, gun-loving, Bible-bashing, racist, war-mongering bullies. During the Bush Administration, everyone was allowed to project their anti-American feelings onto him, and onto Republicans and Christians (never the black ones, of course) in general. Now that we’re in The Obamessianic Age, they can’t possibly project any of that onto this President on whom they’ve invested so much, emotionally and intellectually. And so they find another target. Granted, Palin does actually embody several of those qualities they don’t like, but that’s only bad if one is already biased against things like hunting and Church-going and fiscal conservatism. Nearly all criticisms from the Beeboids of Sarah Palin have been pure class and anti-religion bigotry, with a hint of sexism thrown in. They see everything in her that they have always hated about us. Worst of all, they fear that we might vote for her, or she might influence enough of us to vote for someone like her in 2012, thus bringing an end to their hopes for the kind of US they think ought to exist. Yup, that just about covers it David P.
Do you want to rephrase that – I am British and do not hold those views. I think you mean “the European and British elite”. How about “those who have always, etc. ?” And it’s not just the elite, not by any means. I’ve met plenty of working and middle class people who have the same anti-US sentiments. He said ‘most British’ and he’s probably right. Face it – we’re in a minority here. typical of bbc bias against sarah palin. imagine what they will do when she runs for president in 4 years. if she gets lefties that worked up then she must be doing something right! The BBC has become a last refuge of the imperalist mindset. Flooding the world with pontificating reporters- if that is what they call themselves- and judging, judging and more judging of those lesser beings who simply have not seen the true liberal way of virtue. I hope the good people of the US see us for what we mostly are. A third rate small country almost bankrupt and heading fast into the third world. Some people say we punch above our weight. We have no weight. Sarah Palin should , and probably does, pay not the slightest attention to the mouthings of the English twitterers, For that is all they are- twitterers. PS this goes for the Swiss as well. I think the more immediate problem is that the current US President doesn’t pay the slightest attention to the mouthings of the British Prime Minister. But the BBC won’t really talk about that. I also think a large part of the lefts, and especially al beebs, hatred for Palin stems from her “electrifying” nomination speach given at the Republican convention. From that moment on she was a marked women. I mean, how dare she take the p1ss out of the lefts sun god! The thing that appealed to me was the fact that she had NOT enriched herself on the pork belly of politics (unlike the other three who were all millionairs BECAUSE of politics). Oh and the fact that she actually had a track record of fighting political corruption, unlike the guy now in office, whi directly benefited from political corruption in Chicago. Difficult for Beeboids to realise that many Black people are socially and politically conservative ! 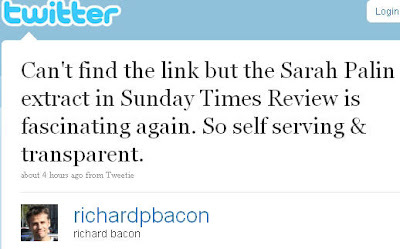 Who put the “p” in Richard Bacon and shouldn’t sombody take it out ?